The responsibilities of motherhood start before your baby is even born. If you are pregnant or think you are pregnant, getting prenatal care is one of the most important things you can do for your health and the health of your baby. During the course of your pregnancy, you should have many prenatal visits with your doctor. These appointments allow your doctor to give you checkups and spot any possible health issues. Early treatment can cure many pregnancy-related problems and stop others from happening. Depending on the stage of the pregnancy, doctors also might give blood tests and imaging tests, such as ultrasound exams. It's important not to skip any of your prenatal appointments. "There are many important milestones during pregnancy," said Sanjiv Shah, MD, MPH, Chief Medical Officer at Fidelis Care. "As soon as expectant mothers think they are pregnant, they should see their doctor to ensure they are getting proper prenatal care. It makes a tremendous difference in the baby's health." For your first prenatal visit, your doctor will ask about your health history, perform a full physical exam, take your blood and urine for lab work, answer your questions, and predict your due date. Later prenatal visits will probably be shorter, but will include wonderful moments like hearing your baby's heartbeat (usually at about 12-14 weeks) or seeing an ultrasound picture of your baby (usually at about 18-20 weeks). Your doctor also will check on your health and make sure the baby's growth is good. 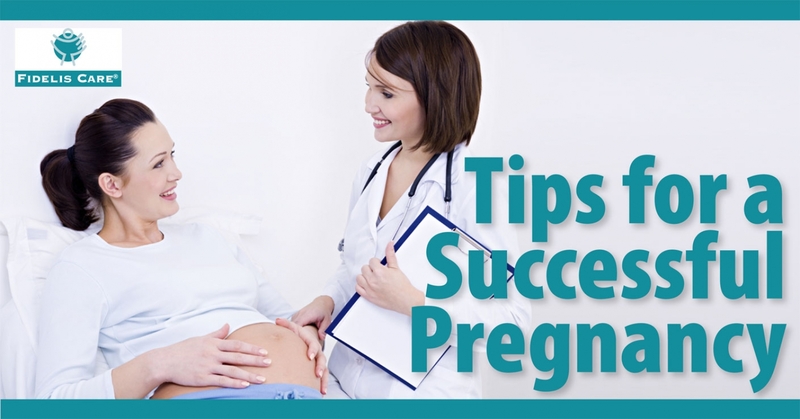 In addition to regular prenatal visits, here are other tips to ensure a healthy pregnancy. Take a multivitamin or prenatal vitamin with folic acid every day. Folic acid is most important early in your pregnancy, but you should take it the entire time. Don't start or stop any medicines without talking to your doctor. Your doctor will be able to tell you if any medicines are not safe during pregnancy. Have a well-balanced diet. Pick fruits, vegetables, whole grains, calcium-rich foods, and foods low in saturated fat. Avoid uncooked or undercooked meats or fish that could cause food-borne illnesses. Don't smoke, drink alcohol, or use drugs. These are all dangerous to your baby's health. Try to keep away from secondhand smoke as well. Talk to your doctor to see if an exercise routine is right for you. Exercising during pregnancy can help your back feel better and help you get a good sleep. Take a childbirth class to learn more about having a healthy birth and a healthy baby. Ask for help from your husband or partner, other family members, or neighbors to help around the house, prepare healthy foods, and get you to doctor appointments. Having people support you will make your pregnancy easier. If you have a cat, ask your doctor about toxoplasmosis, an infection that can be transmitted while scooping dirty cat litter. If not treated, toxoplasmosis can cause birth defects. Fidelis Care offers quality, affordable coverage for children and adults of all ages and at all stages of life, including products available through NY State of Health: The Official Health Plan Marketplace. Our BabyCare program is available to all pregnant members and supports their health by offering counseling and advice. Members who join BabyCare are assigned a Maternal Care Associate to help guide them through the pregnancy and find them resources. For more information, call Fidelis Care at 1-888- FIDELIS (1-888-343-3547) or visit fideliscare.org.